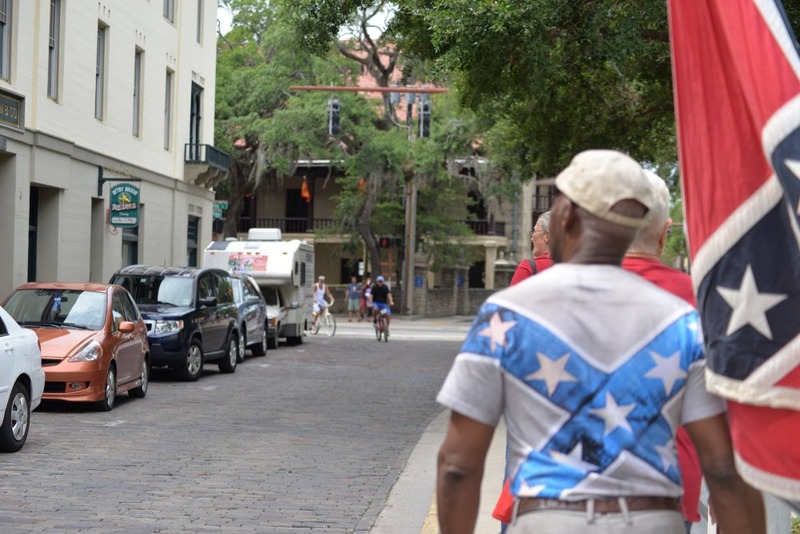 In 2014, HK Edgerton predicted that Florida would be a battleground for Southern History and Heritage in '15 and '16. He was right. First, the Florida Veterans Hall of Fame, then after the Charleston Massacre, on onslaught of attacks came on monuments, statues, flags, historical displays, the senate seal, and even headstones in cemeteries. HK Edgerton has helped us in Florida with the Olustee Monument and he marched through Florida on his first leg in April and May. 32 donors raised most of the $2500 we needed for that leg of his march. He inspired supporters and confounded the uneducated on his Southern Cross Revival March. Save Southern Heritage is seeking to raise another $2,500 for 20 hotel room nights, and mileage for Mr. Edgerton's trip. Get on board HK Edgerton's "Truth Train" and donate today! The date has not been set, but planning is in process. *$25 level or higher will receive 2 "Thumbs up for Dixie" decals. *$50 level or higher will receive a March T-Shirt and 2 "Thumbs up for Dixie" decals. (Make sure to enter your size in the donation comment. *$100 level or higher will receive a year's membership in Save Southern Heritage - Florida, as well as a March T-Shirt and 2 "Thumbs up for Dixie deals. You must enter your address, email address (and shirt size) so we can send the thank you gifts out to you when donate (or send an email to floridasshe@gmail.com) or we cannot fulful the gift. If you love your Southern Heritage, this is a once in a lifetime opportunity to tell the truth about our flag and our history before it is all gone. Any amount will help. Thank you for your participation and any help you can give to Save Southern Heritage! Mr. Edgerton wants to come back to Floirda to continue his march. If you didn't get to particiapte in the first one, you can get on board HK Edgerton's Truth Train later this year. 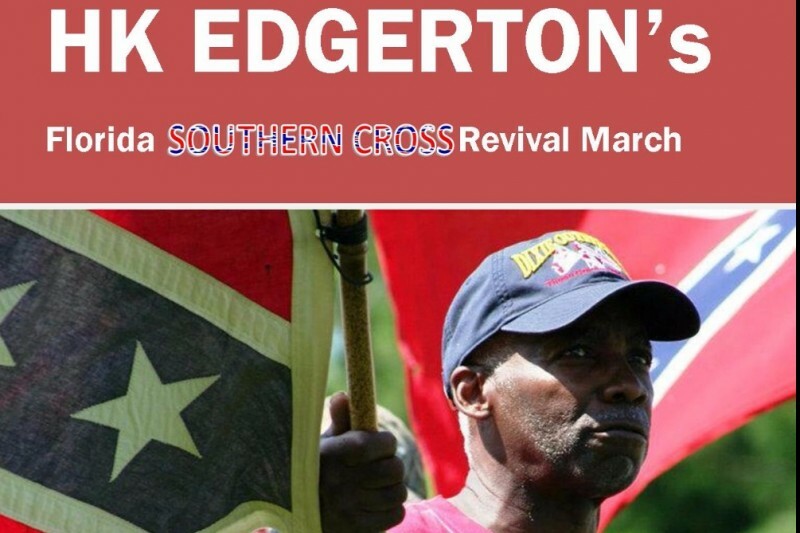 Thanks to all the donors for HK Edgerton's Southern Cross Revival March through Florida. Want to particpate? We''re almost to 25 percent of our goal. Do you know anyone that would be interested in helping? If so, please send them the info and ask them to donate to help HK get to Florida! Thank you to all the donors we're reaching our goal. We just posted a video about HK and his march that you might like to see on FB page. Enjoy! I wish that I had funds to donate, but I do have great admiralty for what you are doing. God bless you and keep you safe in your travels. Saw you on Patriots Soapbox. I will send more later. Thank you Patriot. A True Man of God and Great American. Thank you Sir. Thank you for your beautiful interview on the Patriots Soapbox. So much admiration for you, Sir! Thank you for standing up for the truth.